"Kobi" is our treasure! 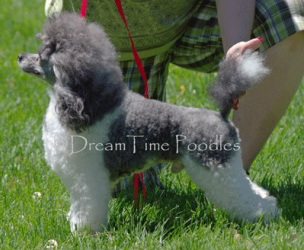 He is a UKC Champion poodle stud, blue & white particolor. He throws puppies who are such excellent quality, many of them are champions themselves! He is 10 1/2" tall, weighs 7 lbs. His pups range between 9" - 12" tall depending on the female he is bred with. His silver babies are to die for! Click on the photo to see Kobi's pedigree. "Ace" is our miniature poodle stud. Bred right here at home, we are very proud of the gorgeous guy he is turning out to be! Grandson of UKC CH Kobi. He stands 13" tall and weighs 13 lbs.